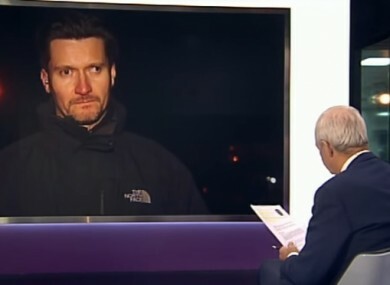 Mark Kennedy being interviewed on Channel 4 News in 2012. IT SOUNDS LIKE something straight out of a James Bond movie but that is a line from this week’s Dáil transcripts. During a Leaders’ Question session, the house was informed that an undercover British agent – infamous following an inquiry in the UK – also operated in Ireland. While the fresh revelations went somewhat under the radar on Wednesday (because of the explosive nature of Brendan Howlin’s contribution to the whistleblower debacle), AAA-PBP TD Paul Murphy told the chamber that the “the security forces here would be very concerned about agents from another country operating in this jurisdiction”. The Taoiseach was told a British citizen, Mark Kennedy, has been exposed as a “secret member of the national public order intelligence unit” in the UK. The story of Kennedy has been widely reported about over the years – in both the Guardian and the Daily Mail. In 2011, details of Kennedy’s double life during which he embedded himself with environmental activists for more than seven years, began to emerge. The Guardian reported that Kennedy visited more than 22 countries taking part in protests against the building of a dam in Iceland, touring Spain with eco-activists, and penetrating anarchist networks in Germany and Italy. However, the story has now landed on Irish shores. He had multiple intimate relationships with women using his false identity as an environmental activist called Mark Stone. While travelling the world, it’s claimed Kennedy had many sexual relationships with women within the activist movements. It resulted in some of these women taking legal action against the police. Subsequently, the Metropolitan Police in the UK published a full apology for ‘totally unacceptable behaviour’ of undercover officers entering into such affairs with women. A settlement was also reached between the police force and the women. The Police Inspectorate in the UK also carried out a review into the cases, and called for better oversight of those that carry out covert work. The Telegraph reported Assistant Commissioner Martin Hewitt said sorry five years after the women first launched legal action following the unmasking of Mark Kennedy. On Wednesday, Murphy told the Dáil that a woman who was involved in a protest group was in a relationship with Kennedy while he was operating in Ireland. He highlighted the case of Sarah Hampton, a US citizen who met Kennedy on these shores in 2005. Finding out that Mark was an undercover police officer brought about a deep depression that seemed impossible to navigate, there were times I almost gave up completely. The process of seeking justice on this case has felt at times belittling, intimidating and downright scary. … I felt I had been raped. I never consented to sleeping with a police officer. Murphy told the Dáil that Hampton was granted an apology last month by the Met Police. Following these revelations, there were calls for a full investigation. The Pitchford inquiry was launched in 2015 following scandals involving officers and women who said they were tricked into relationships. In Belfast earlier this week, campaigners took a legal case over the failure to include Northern Ireland in Lord Justice Pitchford’s inquiry. According to the Belfast Telegraph, Jason Kirkpatrick was granted leave to seek a judicial review of the government’s refusal to widen the probe beyond England and Wales. His lawyers argued that officers attached to the Metropolitan Police and the National Public Order Intelligence Unit secretly travelled to Belfast for spying purposes without PSNI knowledge. Following the court case in the North this week, and pointing out that a woman in Ireland had also been victim of undercover police officers entering into sexual relationships with women, Murphy said he wanted the Taoiseach to formally request that the inquiry now be extended to Ireland as well. We know the German government has written to the British government seeking the inclusion of the actions of the so-called spy cops in Germany, and we know the Scottish government has done the same. We also know that British undercover police officers were operating in this State yet the Irish government has so far refused to request the inclusion of their activities in that investigation. Why is that? Murphy said the “political policing” targeted left wing and environmental activists, breaching their right to privacy in this State, which is enshrined in the European Convention on Human Rights. “It is incomprehensible and unexplainable why that request has not been made unless the Irish Government is saying its protection of British spies in Ireland takes priority over the wish of these people for answers and justice,” said Murphy. The Dublin South-West TD said those affected are now seeking answers and justice. Mark Kennedy was not just one bad apple. He was part of a system of political policing and abuse of rights. As well as him, we know of at least three other undercover British police officers who operated in this State – Jim Boyling, Mark Jenners and John Dines. There are a huge number of unanswered questions here. He said the Minister for Justice and Equality Frances Fitzgerald had already confirmed that gardaí were aware of Mark Kennedy’s presence in Ireland. Murphy asked the Taoiseach on what basis and on whose authority did he have permission to operate in Ireland and questioned if the government knew of other undercover officers. He claimed that there have been 56 convictions or prosecutions overturned in Britain as a result of Kennedy’s involvement. The deputy called for the report commissioned in 2011 by the Garda Commissioner into Kennedy’s activities to be published. The Taoiseach confirmed to Murphy that the Minister for Foreign Affairs and Trade Charlie Flanagan will meet with the Northern Ireland Secretary of State, James Brokenshire in Dublin next week to discuss the matter. However, he said the minister has not seen the garda report which investigated the relevant and related issues. The security forces here would be very concerned about agents from another country operating in this jurisdiction. We have had incidents of that in the past. Kenny said the minister will make a further statement following that meeting. Email “The curious case of how a British cop went undercover among Irish protesters”. Feedback on “The curious case of how a British cop went undercover among Irish protesters”.